To learn (or review) information about circulation. 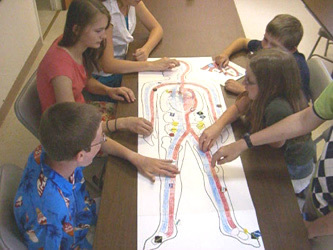 Basic science concepts covered: distribution of oxygen to cells and carbon dioxide to lungs via red blood cells, production of red blood cells in bone, delivery of sugar and protein to cells via the blood stream, delivery of wastes to the kidneys for disposal out of the body, the heart as the driving force that keeps the blood moving, the “map” of the circulatory system in and out of lungs, heart and body parts. This is a two-team game that can accommodate 2-6 players (possibly 7 or 8). Players spin the heart spinner to find out how many beats the team gets that turn. Each player gets to move either a blood cell or a food or waste token towards its goal–either cells or the lungs or the kidneys. Oxygen and carbon dioxide must ride on top of red blood cells. Food and waste molecules can simply move along the track without the help of a red blood cell. The first team to get all their oxygen and food delivered and all their waste and carbon dioxide disposed of wins the game.